So much of the justification for common core requires us to accept the false premises offered. 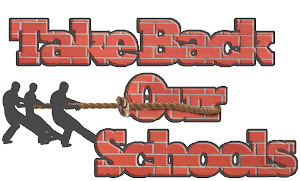 In most cases the premise is that we currently do not do the things that common core does. Then, using a combination of impressive sounding words, vague promises and, in some cases outright lies, the proponents of common core have been able to bamboozle a lot of people into believing that these standards are the answer to our "educational crisis." Take the promise of common core to promote "critical thinking." The phrase has always had a positive connotation. Critical thinkers do not blindly accept anecdotes as facts and/or regurgitate unproven facts to support their conclusions. They do not jump to conclusions. The promoters of common core claim that critical thinking is an advanced skill that will be needed by all future employers. Of course the false premise is that, to date, our public education system has not had an emphasis on, or valued, critical thinking. The implication is that we have taught blind adherence to facts presented on a page thus making our children little automatons who regurgitate back on the test exactly what they have been taught. Worse yet is the inference that critical thinking is a separate skill that can be taught and measured. So if we haven't been teaching critical thinking and have only required our students to repeat back on a test what they have been taught, then what does the better teaching model look like? What does "critical thinking" mean in common core? "Mathematically proficient students try to communicate precisely to others. They try to use clear definitions in discussion with others and in their own reasoning. They state the meaning of the symbols they choose, including using the equal sign consistently and appropriately. They are careful about specifying units of measure, and labeling axes to clarify the correspondence with quantities in a problem. They calculate accurately and efficiently, express numerical answers with a degree of precision appropriate for the problem context. In the elementary grades, students give carefully formulated explanations to each other. By the time they reach high school they have learned to examine claims and make explicit use of definitions." The only sentence in that paragraph that relates to a math skill is the fifth one which says, "They calculate accurately and efficiently, express numerical answers with a degree of precision appropriate for the problem context." The rest of the standard refers to communication about math. I guess the first step in critical thinking is to learn how to think about math in a way defined by someone else. Critical math thinkers can "examine claims" about math rather than proving an equation true or false using universally accepted math formulas. Apparently Pythagoras was only making a claim about right-angled triangles. The only time the word formula enters this math standard is in elementary education where students will be expected to give "carefully formulated explanations to each other" because under common core, as soon as you master a new math concept you must jump to the role of teacher and teach your peers at a level equal with that of the man or woman in the front of your classroom. Your explanation cannot be the simple one of 6 year old, it must be carefully formulated. That is the rigorous standard to which first graders will be held when they first get into school. I'm sure that won't turn any of them off to school when they are just beginning. One additional point on this math standard; how do those who claim the standards don't tell teachers how to teach, reconcile math standards that require students to focus on behaviors relating to solving math problems, with that claim? Teaching behavior would not be the first thing to come to my mind if I were teaching math. On the English side, "critical thinking" results in "reflection" papers students have had to write about their personal growth. One teacher shared with me, "I can't tell you how many graduate student lesson plans (from teachers who have been fed the praises of CC for two years) with formative assessments in which classroom assessments are designed for students to discuss their 'feelings' about what they've learned." Critical thinking is beginning to sound like the kind of stuff you do on the psychiatrist's couch (apologies to any psychiatrists out there for the gross stereotype.) This teacher has a better grasp of what to expect from students, "I throw a wrench in the system by writing commentaries that formative assessments are supposed to be assessments of progress toward a goal derived from an academic standard -- not an emotional response by adolescents with fluctuating hormones." What do common core writers think they are getting with their focus on critical thinking? For them, critical thinking will lead to greater creativity than wrote memorization of content. They believe the building blocks of facts will be "discovered" or will "hamper the development" of a new level of understanding. They disregard the fact that a foundation of knowledge and skills is what enables one to create novel combinations and generate new ideas. It is content knowledge develops critical thinking. Think of it this way. Let's say you want to develop a solution for a cleaner fuel. Proponents of common core, and many educators today, say that the access students have to the information on the internet means that they won't have to memorize facts about energy, atoms, chemistry or physics that might help solve this problem because they can just look those up. Without that basic content knowledge, what do they type into the search bar? How much longer will it take them to stumble upon a possible solution? There is no critical thinking without knowledge, yet all of education insists you can have the former while pillorying the latter as "mere facts" and "rote memorization." 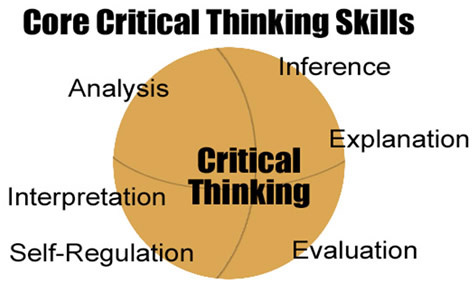 One definition of critical thinking is "to consider something from different points of view." The developers of common core seem to have latched onto this definition, asking students to think critically about things they read and to look for bias. The other point of view they want students to consider is theirs and the bias is an opinion that differs from theirs. In one school district Macmillan designs all the lesson plans and provides a database of additional books that students may read: all published by Macmillan. As a result, only one point of view matters for a student's grade: Macmillan's. Common Core inadvertently pushes textbook companies into a perverse marketing strategy. 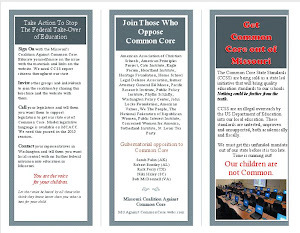 Since everyone is producing text books aimed at covering the exact same standards, they will all have the "Aligned With Common Core" imprimatur on their covers. One of the few differentiating factors textbook suppliers have left to make their books stand out in an increasingly homogenous market is their viewpoint or ideological bent. School districts will face offerings that introduce all manor of "open mindedness" and "critical thinking" about things we have heretofore accepted as fact. If your goal is to teach "critical thinking" as defined by being from another viewpoint, there will be tremendous pressure to choose these alternative viewpoint books. Why, to not do so implies that the deciding committee lacks critical thinking skills. See how this works? The standards further help promote these alternative viewpoints by including all that "non-fiction" reading in the ELA section. Schools will have two choices: 1) have the non-fiction materials read in other content classes where those teachers will need a fair amount of new professional development in order to be able to teach a LA standard or; 2) have ELA teachers assign these texts which they are not used to covering and may not have the expertise in. One Alabama school system has chosen option two and is now using Howard Zinn’s "A People's History of the United States" this way. The English teachers probably don’t know anything about Zinn but they will be teaching a book that never could have made it through the SS textbook committee in 11th grade. In general, monopolies hinder critical thinking and a monopoly is what has been granted to CCSSI. Their very establishment begins a trail to stopping that which they supposedly prize. When "they" say they want children to be critical thinkers, they are actually saying they want children to think critically about the established beliefs they acquired outside of school, at home. The Texas GOP inserted this paragraph in their platform and got some national attention for it. The false premise is that what mom and dad are teaching at home is wrong and needs to be corrected. The false premise is that experts who know better than us wrote standards that are good for our children and good for the education system. The false premise is that they are well intentioned and everyone else is not.